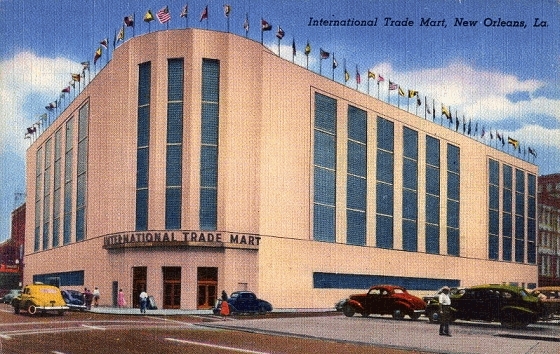 The original International Trade Mart building (since demolished), corner of Camp & Common Streets. The International House, chartered in 1943, and the International Trade Mart, chartered in 1945 (which first opened its doors in 1948), were the two predecessor organizations of the World Trade Center of New Orleans. On May 13, 1966 the City of New Orleans and the International Trade Mart entered an agreement for the construction of a new building at the foot of Canal Street. Plans for a monumental structure to house both organizations were drafted. Several plots of land were purchased at 2 Canal Street where the new ITM building was constructed. 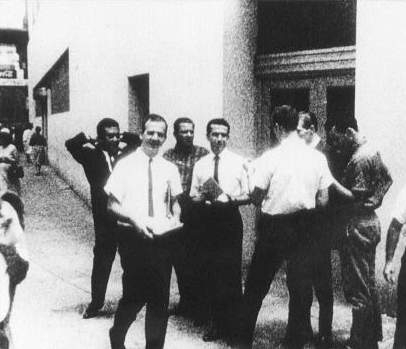 The formal Dedication Ceremony of the ITM building took place on April 30, 1968, as part of a celebration of the 250th anniversary of the founding of New Orleans. Ambassadors from around the world visited the city of New Orleans. Parades and banquets were held, and the Organization of American States brought its first meeting outside of Washington, D.C., to New Orleans. The 33-story, 407 foot-tall skyscraper was designed by Edward Durell Stone. The International House and the International Trade Mart merged in 1985 to form the World Trade Center New Orleans, a private, non-profit organization with a membership of 2,000 corporations and individuals dedicated to improving trade with the city. The World Trade Center of New Orleans is the founding member of the World Trade Centers Association, a worldwide association of over 300 World Trade Centers in nearly 100 countries. Many photos -- First Annual Senior Citizens Convention (Sponsored by NORD and American Women's Voluntary Service - AWVS). Includes shots on board the "President" and in St. Charles Hotel, May 13 -- 15, 1957. Several photos of the NORD.Meet of Champions, May 13, 1955. Jazz drummer Alfred "Tubby" Hal, born on October 12, 1895 in Sellers, Louisiana moved with his family to New Orleans in his childhood. His younger brother Minor "Ram" Hall also became a professional drummer. He played in many marching bands in New Orleans, including with Buddie Petit. In March 1917 Tubby Hall moved to Chicago and played mostly with New Orleans bands; Carroll Dickerson's Orchestra (recording with it in 1927), King Oliver, Jimmie Noone, Tiny Parham, Johnny Dodds, and Louis Armstrong. He can be seen in Armstrong's movies of the early 1930s, including the live action and Betty Boop cartoon I'll Be Glad When You're Dead, You Rascal You (1932) and A Rhapsody in Black and Blue (1932), made by Paramount. Only Armstrong and Hall got closeups in the two films, and both get their faces transposed with those of racially stereotyped "jungle natives" in the cartoon. Hall morphs from a jazz drummer to a cannibal stirring a cooking pot with two wooden sticks. Noted swing and big-band drummer Gene Krupa said that Hall and Zutty Singleton "knew every trick and just how to phrase the parts of the choruses behind the horns, how to lead a man in, what to do at the turn-arounds, when to use sticks and when to use brushes, when to go for the rims or the woodblocks, what cymbals are for." Jazz critic Hugues Panassié considered him one of the three greatest jazz drummers of his generation, along with Zutty Singleton and Warren "Baby" Dodds.Tubby Hall died in Chicago on May 13, 1945. 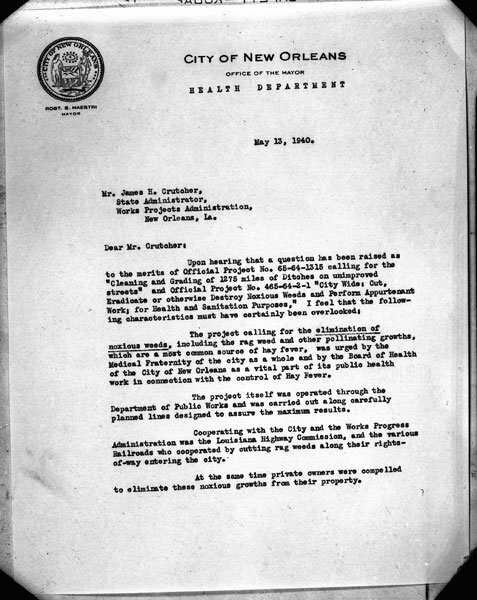 Copy of letter dated May 13, 1940 from J. M. Batchelor, Superintendent of Public Health, endorsing the ragweed project in New Orleans. Rose Street was renamed Boree Street on May 13, 1925. Exactly ten years later, on May 13, 1935, Boree Street was then changed to Green Street. Ney Street was renamed ASA Street on May 13, 1925. 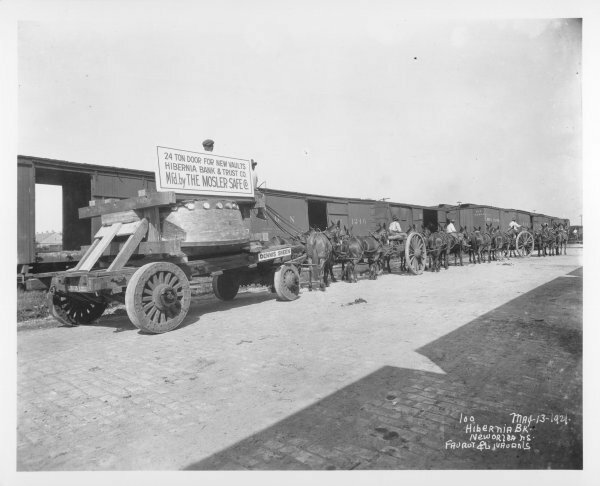 NOPL Charles Franck Photo Collection photo -- A scene at the railroad freight yards, May 13, 1921. It took 8 pairs of mules to haul away this 24 ton door for the Hibernia Bank and Trust's new vault door, built by the Mosler Safe Company. The North Claiborne streetcar line began running on May 13, 1868. It was a downtown (i.e., downriver) line. From 1917 to 1925, it was operated as a single line with the Jackson Line. It's last run was on December 27, 1934. 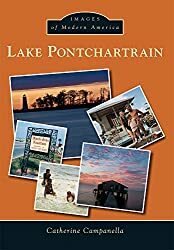 On May 13, 1837 the disaster with which Louisiana had been threatened for a long time, finally fell upon her. Fourteen New Orleans Banks suspended specie payments. As an emergency measure and to afford the community temporary relief, the three municipalities of New Orleans each issued bills amounting to as much as four dollars, but within a short time private companies and even individuals claimed the same privilege so that the State was inundated with rag money. A petition from a Water Works Committee soliciting authorization to build a viaduct on the public thoroughfares was submitted to the Cabildo on May 13, 1835. The Cabildo received a letter from Mr. D'Hemecourt relative to the draining of lots situated back of the city on May 13, 1834.